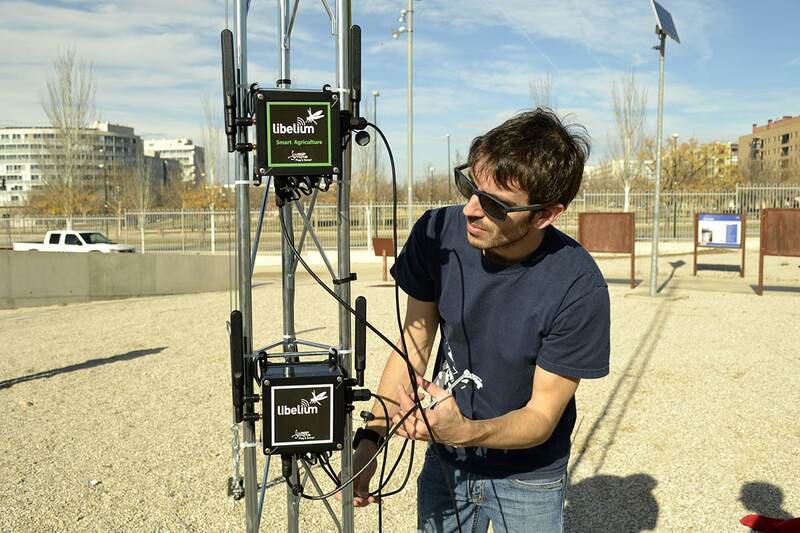 Libelium verifies the accuracy of the weather stations integrated in its IoT platform with the same results as those registered by the Spanish State Meteorological Agency (AEMET). The use of weather stations in IoT projects is commonly widespread in solution development related to precision agriculture. They are also a feature in the control of adverse atmospheric phenomena and study of pollution towards the prevention of climate change. In many countries there are Official Meteorological Agencies that provide climate services such as AEMET, the Spanish agency dedicated to weather forecasting, climate monitoring, seasonal forecasting and climate projections for the 21st century. To this end, AEMET has reference measurement stations strategically located to record parameters at different geographical points. These stations are the most technically advanced and offer the highest accuracy in the market. “Accuracy and quality of technology are two major goals at Libelium. The company is evolving by offering increasingly professional IoT solutions to the market in response to customers’ increasing demand for precision,” says David Gascón, CTO and co-founder of Libelium. In association, just a few months ago, Libelium launched the new IoT solution for precision agriculture, named Smart Agriculture Xtreme. This Plug&Sense model incorporates improved probes and new weather stations from the manufacturer Gill Instruments. 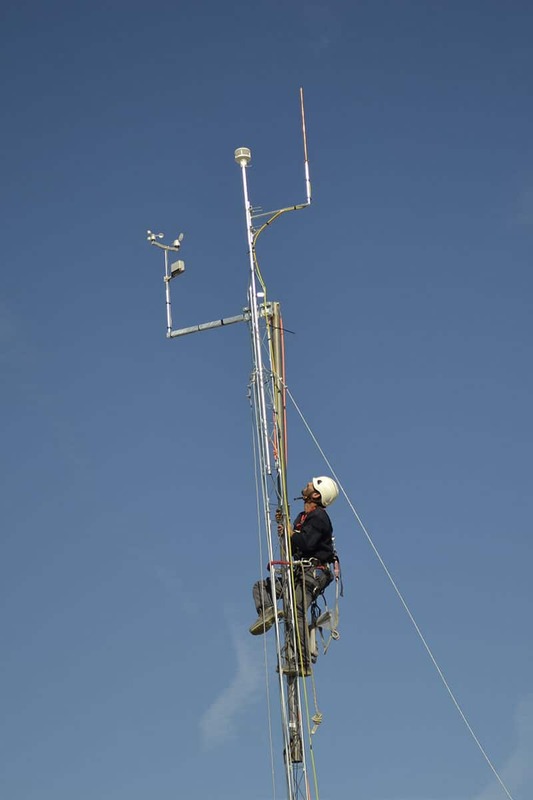 The aim of the project is to establish a comparison of parameters to verify the integration of the new line of weather stations that includes the Smart Agriculture Xtreme solution. Two Smart Agriculture Plug & Sense! nodes were installed for this purpose at ten meters above the ground, connected to two different stations: WS-3000 and GMX-240. Both available in the Libelium sensors catalogue. 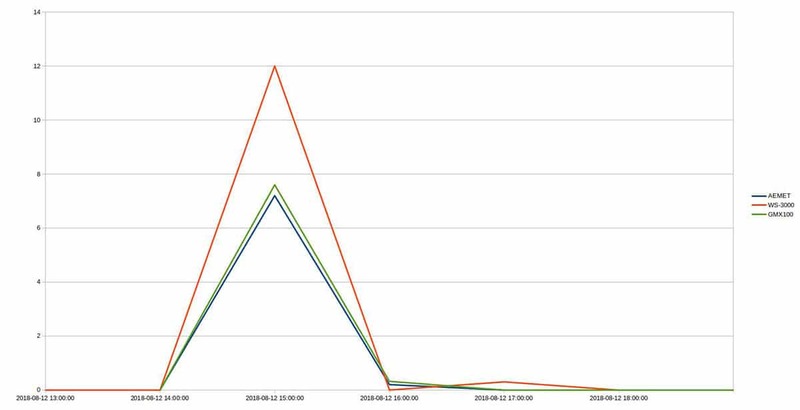 AEMET gave Libelium access to the data recorded in the reference station in order to synchronize Meshlium with the official agency’s public data and compare them with those of Libelium’s nodes. 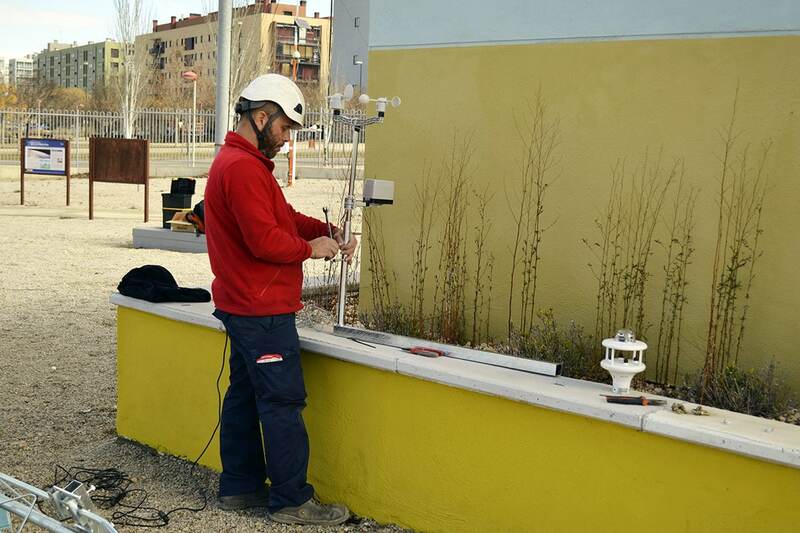 After the first months of data recording and after some storms in the city of Zaragoza, Libelium’s engineering team detected that the location of the pluviometer at 10 meters high affected the measurement results. For this reason, they decided to add another model of station, the GMX-100 that only measures rain, at 1.5 meters from the ground, the same height at which the AEMET pluviometer was located. 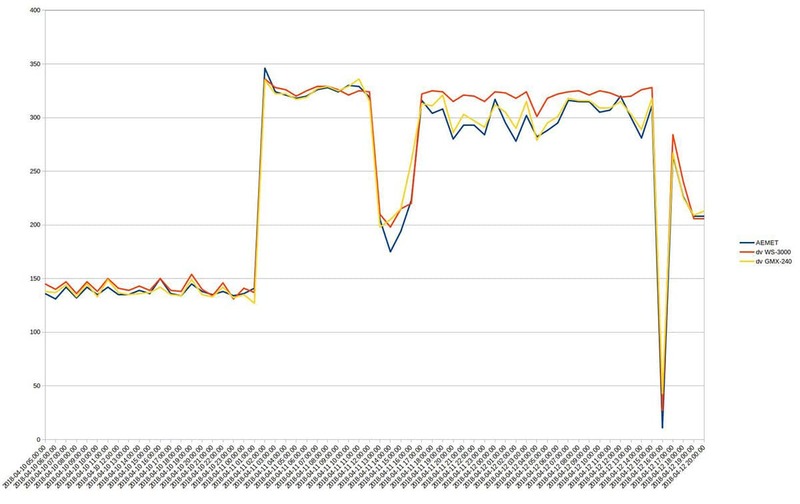 Libelium’s engineering team have tested the GMX-240 station for a weather forecast application, providing new measurement parameters (wind and rain) that cannot be achieved with the rest of the existing sensors. For precision agriculture projects or smart cities, it is advisable to use this station at an intermediate height (between 1.5 and 3 meters high) to measure both parameters together without problems. Professional and official weather stations record the following parameters according to the World Meteorological Organization (WMO). This is an international organization created within the UN to facilitate cooperation between national meteorological services and promote and unify measuring instruments and observation methods. 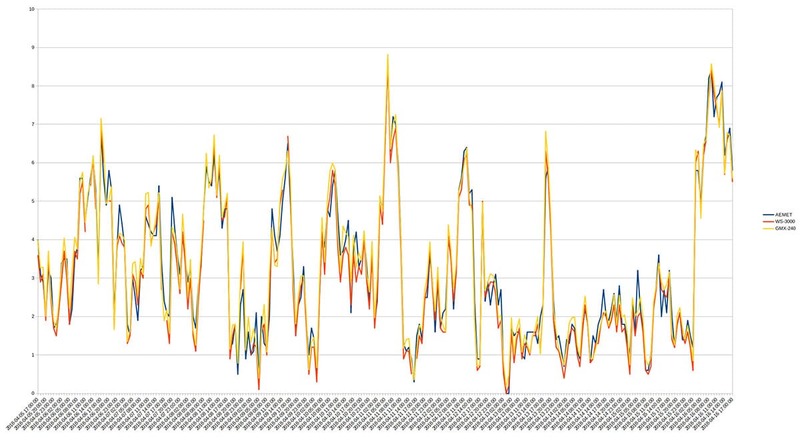 Average wind speed: an average climb of acquired samples every 0.25 seconds or 1 second in the 10-minute period preceding that measurement (metres/second). Average wind direction in the 10-minute period prior to the date and time of measurement (degrees). Accumulated precipitation, measured by the rain gauge, during the 60 minutes prior to the time of measurement (mm, equivalent to liters/m²). 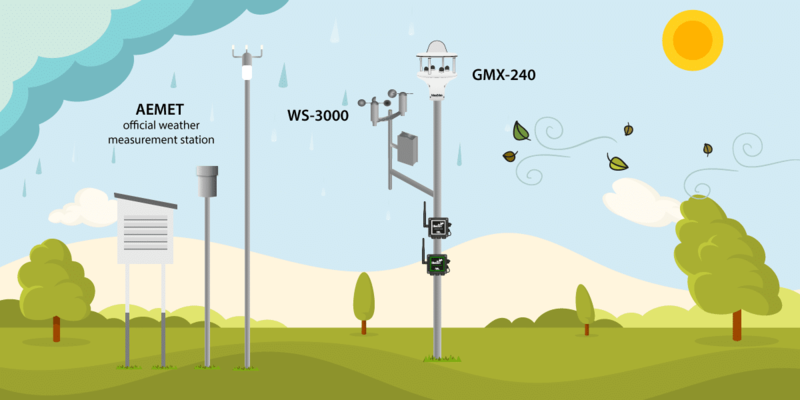 The results obtained in the comparative study show that the GMX-240 station behaves in parallel and with the same precision as the official AEMET meteorological station, both in terms of wind speed and direction and in terms of accumulated precipitation parameters. The WS-3000 station, which has mobile components, produces a certain decalibration effect and therefore requires greater maintenance. In fact, during the first months, the installation gave good results in comparison with the AEMET station. But over time it began to fail because of the friction produced by accumulated dirt. Libelium’s engineers also highlight the electronics included in the Gill Instruments GMX-240 station for the quality of its instruments and as it provides value when measuring parameters in official units. However, the WS-3000 station provides raw data that requires further analysis software in order to objectively compare the accumulated records. Join our mailing list and stay updated with the latest news and updates from our team.